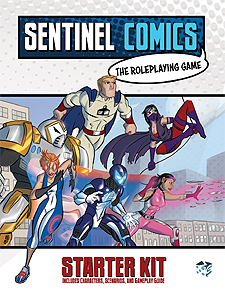 In these six exciting adventures from the pages of Sentinel Comics, you play as the Freedom Five and their former intern Unity in the timeline gap between the end of the Sentinels of the Multiverse card game and Sentinal Comics: The Roleplaying Game. Each hero has their own booklet, detailing who they are, how their character sheet works, and what they can do. All this, plus the Gameplay Guide, add up to a total of 13 booklets included in this Starter Kit! Heroes, you must help rebuild Megalopolis and reunite the hero teams of the world, all while staving off attacks from the villains who threaten us all! Can you uncover who is behind these attcks before it's to late?